The quality and the look of your new deck depends on the type of wood that you select. Different types of wood have different characteristics. Therefore, the e choice of wood depends on the characteristics that appeal to you most. Pressure-treated pine may not look good and may be unhealthy for use in your deck. However, it repels pests and does not rot. For a deck that is attractive and safe, look for wood that is durable yet pretty for your deck stairs, steps, floors, and railings. The pressure treated wood described above can be used for supports and the frame. If you would like to have wood from tropical rainforest wood, ensure that it has a Forest Stewardship Council trademark that is a certificate that the timber is harvested responsibly. Ipé is a South American hardwood with high-quality characteristics. USDA Forest Service Products Laboratory gives thumbs up to the wood for its root and bug resistance capabilities and the fact that the wood is hard. The wood is as hard to burn as concrete is. It is very heavy and dense too making it great for slate and stone accents. Tropical rainforests are highly protected. Therefore, ensure that there is responsible harvesting of the wood. This type of wood comes in reddish brown color but turns silvery gray when it ages. Unfortunately, it splinters fast but stays in good shape in rain, cold, sun, and heat. You can use a penetrating stain to add durability and beauty to the wood. This soft lumber age to a gray color just like cedar does. It also resists rot. Unfortunately, it blackens if exposed to prolonged moisture. Make it more attractive by using a sealer. This hardwood tree grows well in the tropics. It has great resistance to rots and pests. It looks like teak if treated with marine oil. Otherwise, you can let it age gracefully to a silvery color. There are several varieties in the market, each with its benefits and cons. As always, ensure that it has FSC trademark to depict responsible harvesting. The common Philippine Mahogany is not genuine mahogany as Shorea woods from Asia use the trademark. 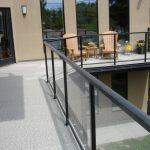 There are other alternatives to wood for outdoor decking to include a wood-polymer and plastic polymer. The use of these synthetic materials makes the deck rot and bug proof. However, if you like the real deal, this is just an imitation with good qualities. 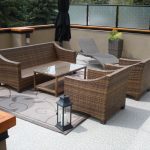 If you are looking for a wood deck solution or cedar decks in Calgary contact Mountain View Sun Decks, we are a custom decking contractor that specializes in deck design and installation.